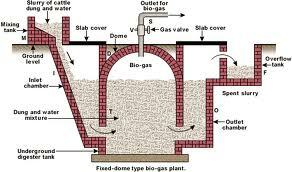 Biogas is a gas mixture which is generated when organic compounds are fermented in the absence of air (anaerobic fermentation). This gas mixture is mainly made of carbon dioxide (CO2) and methane (CH4). Methane is a combustible gas, which means it can be burned. It can be used as a fuel for cooking and lighting. A plant to collect biological gas has five components: the inlet, the fermentation chamber, the gas, the gas storage bag or tank, and the outlet and the exit pipe through which the gas is removed. Organic matter such as manure (human or animal), duckweed or rice straw is brought into the fermentation chamber (through the inlet). The process of anaerobic fermentation will take place here to generate biological gas (biogas). It will also produce a substrate rich in nutrients which can be used as organic fertilizer or fish feed. The processing of manure, organic rubbish and wastewater in the plant helps to keep the environment clean. There is no longer any bad smell from sewage or livestock manure. 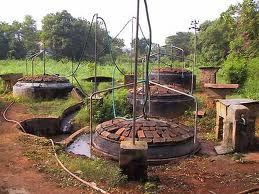 Cooking by biogas is much cleaner than cooking over a wood fire, and there is no smoke to cause lung problems and eye diseases. Begin by loading the fermentation chamber with the materials to be fermented (manure or other wastes). You should begin with an initial load of 300 - 500 kg of materials for each cubic meter of the fermentation chamber. This needs to be supplemented by an additional 8- 10 kg each day for each cubic meter of the fermentation chamber. The gas output will be 250 - 400 liters for each cubic meter of the chamber. Expressed another way, 1 kg of manure will have a gas yield of 30 - 60 liters/day, for several days. The gas yield from 1 kg of water hyacinth will be 40 - 50 liters/day, for several days. One cubic meter of gas (= 1000 liters) is enough to cook the day's food for a 6 - 7 member family, or provide lighting for 4 - 5 hours. It could replace one liter of petrol to operate a 400W electric generator for two hours. The plant must be tested to make sure it is water-tight and gas-tight. Enough fresh material must be added before it is used every day. There must be a water source to provide enough water to clean the livestock pens regularly, to provide fresh material for the fermentation chamber system. (Each liter of manure needs 1 - 3 liters of water). The plant must be equipped with a safety valve or U-shaped barometer. Chemicals such as detergents or pesticides must not be put into the fermentation chamber. After fresh manure and water is added to the fermentation chamber, the valve should be opened so the gas can escape. At this stage, the gas is mainly carbon dioxide. 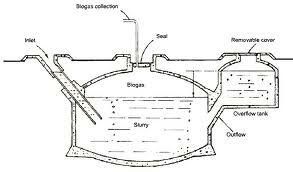 This should be done once or twice, before the biogas plant comes into use for biogas production. The gas from the fermentation chamber is not used directly, but is stored in an auxiliary gas tank protected by a safety valve. It is this auxiliary gas tank, not the main gas tank, which is connected to any domestic appliances.